As owner operators of this multi award winning property , Lazy Lizard Motor Inn offers excellent amenities and facilities with personalised services by your hosts. Their spacious comfortable Studio Units are suitable for one to five people. They offer free wi-fi in all rooms and a free internet terminal in reception, free under cover parking, free bikes and free DVD library and rooms are serviced daily. There is a guest laundry, the units have kitchenettes, air-conditioning, ceiling fans and room to spread out and relax. Saltwater pool, and barbecue set amongst lush tropical gardens, an easy walk to the famous Four Mile Beach. Free tour desk are just some of the great features. 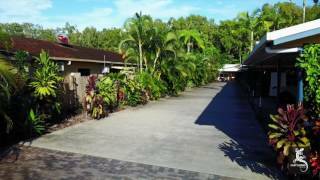 They invite you to enjoy the tropical laid back lifestyle and atmosphere of the Lazy Lizard Motor Inn, in this beautiful region of Tropical North Queensland, Australia. Let them arrange your tours and airport transfers to paradise. They offer free wi-fi and a free computer at reception, free under cover parking, free DVD library and free bikes, the rooms are serviced daily. There are kitchenettes, air-conditioning, ceiling fans and room to spread out and relax. They offer free wi-fi and a free computer at reception, free under cover parking, free DVD library, free bikes and rooms are serviced daily. There are kitchenettes, air-conditioning, ceiling fans and room to spread out and relax. These two types of studio rooms are about the detail, superior beds, refurbished rooms, and tropical runners.